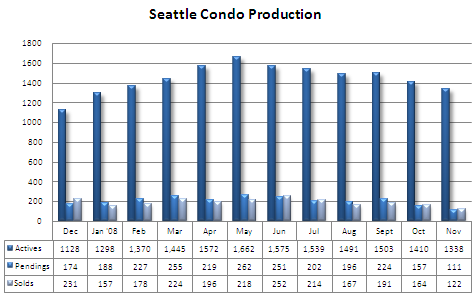 Citywide, Seattle condo values held firm last month at $303,000. That’s up 5.4% from October and was relatively on par (-0.65%) to November 2007. Capitol Hill, North Seattle and West Seattle’s year-over-year values for November either saw a small increase or remained unchanged, while Queen Anne and Downtown realized declines. Year-to-date, the citywide median price is down 1.6% compared to the same 11-month period last year. The number of active listings dropped by 72 properties to 1,338, a 5.1% decline from October and the fewest number on the market since January. Compared to November 2007, the number of listings was down 4.2%. Condo inventory levels will likely continue to decrease contemplating seasonal factors, reuse as rentals and seller concerns about falling values in the short term. Sales activity, on the other hand, have slowed considerably reflected by a 60% drop in the number of properties going under contract, 111 last month compared to 278 in November 2007. As a result, the inventory supply rate rose sharply into double-digit territory to 12 months, ensconcing Seattle deep in a buyer’s market. Going forward, the continual economic meltdown, employment security concerns and general uncertainty will keep many buyers at bay, further depressing the condo market. 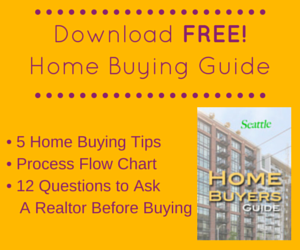 Condo sellers will need to adjust their expectations accordingly if they hope to lure buyers. However, we are seeing new buyers come off the fence, predominately investors but also potential homeowners, who are enticed by falling prices and better mortgage terms. Mortgage rates have been decreasing and for well-qualified buyers, at this writing, the 30-year fix rate is now in the low 5’s with expectations that it could drop into the 4’s. For those well-positioned to purchase, there are good opportunities available considering the depressed values, historically low interest rates and buyer incentives. 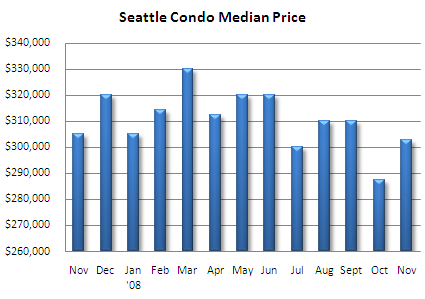 With the sales volume so low, there is a possibility the NWMLS median price stats may improve in December and January. There are two factors for this. 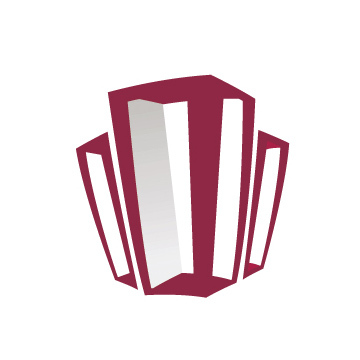 First, the completion of three luxury developments – The Four Seasons, 1521 and Olive 8. With their higher sale prices, the median price is likely to inch up, particularly for downtown (MLS Area 701). 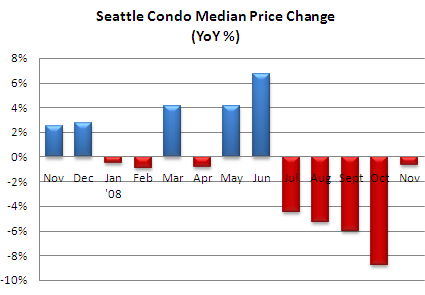 Second, condo sales that would depress values, i.e. 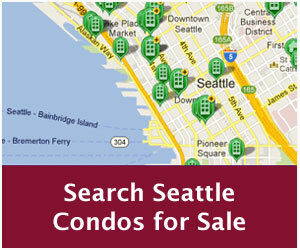 those sold at auction, won’t be included in the NWMLS stats as they’re sold outside of the multiple listing service. While the omission of the auction sales may skew the stats, historically, most new construction properties haven’t been contemplated in the NWMLS stats either. 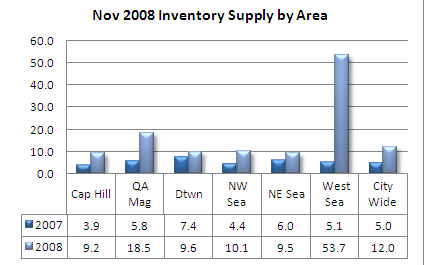 West Seattle’s stratospheric inventory supply rate is the result of only 3 properties going under contract last month while the number of active listing increased by 49 (161 actives divided by 3 pendings). 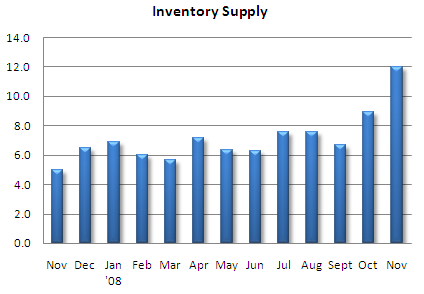 Good to hear that you don’t seem to have an oversupply of inventory in your condo market! Sounds like your market is bucking that trend. I live in a condo market in new jersey and it is quite saturated and prices are declining, however single family homes are staying pretty good right now and weathering the storm alright. good luck!